The setup: An upper low was over NE IA moving SE, with a surface cold front trailing to S then SW, from just W. of Dubuque to SE IA, then into north central MO. A squall line ahead of the front was moving into an area in west-central IL with CAPE 1500 - 3000 and SRH around 100, with models progging 200 in some areas by 0Z. A blue box was issued W of a Springfield to Brighton, IL line till 8:00. (Later this was replaced with boxes for all of west central, central, and southwest IL and northeast and east central MO until midnight.) The helicity-CAPE combination was probably sufficient for imbedded supercells in the squall line though it would be marginal for tornadoes. The temperature in most of west central and southwest IL was in the mid to upper 80s, with dewpoints mainly in the 60s. The surface wind was SSW at 10-15 mph, but a strong mid-level jet was entering area from the WNW. 5:25 - Out the door. I head north from Edwardsville on IL route 159, jog west on 16, then north again on U.S. 67. 6:20 - 3 mi. S. of Greenfield, IL; CB anvil is visible ahead, with elevated TCU to NW. Other, lower clouds are between me and the storm. The lower sky begins to darken under the anvil. As I continue north from Greenfield, I notice some mammatus above as I increasingly get under the anvil. 6:50 - Just ahead of storm at E. edge of Winchester. (Wind damage occurs in Hannibal about this time, about 40 MI W or WNW of my location.) 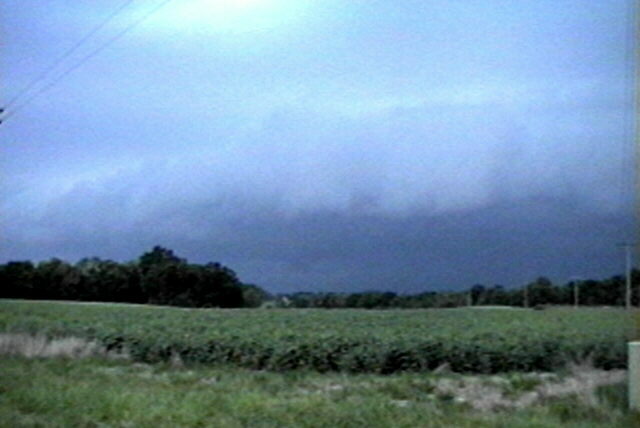 I watch an impressive shelf cloud gradually approach from N. (This and all other images in this report are video snaps.) I videotape the shelf cloud and lighting. A particularly heavy cell is to my NE, probably not far from Jacksonville. Here is a view in this direction, and here is the same view with lightning. The leading edge of the wide, roiling shelf cloud moves over me. It becomes very dark. I watch the storm for about 20 minutes until I am overtaken by heavy rain and 35-40 mph wind from NW. 7:15 - I bail south on 106 to get back ahead of storm. I see a new strong cell to my WNW on the line of storms, and detour west toward Patterson to investigate what looks like a possible wall cloud. 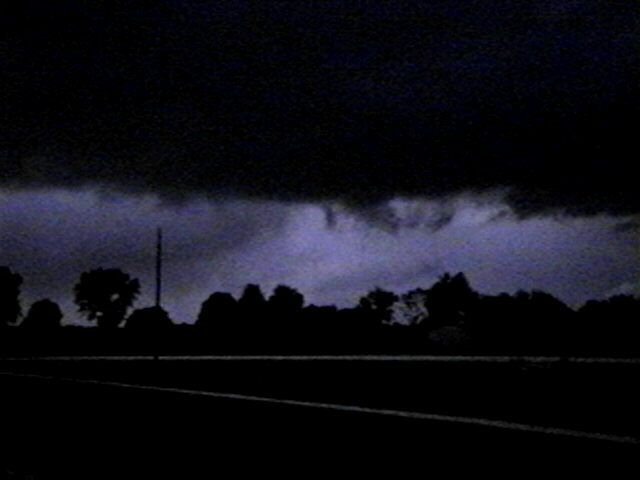 It turns out it is a shelf cloud; the storm is again about to overtake me, so I return to 106 from a T-intersection 2 mi. W of 106. 7:25 - I stop to tape lightning just S. of White Hall. There's lots of it to my N, NE, and NW as a severe cell approaches. The shelf cloud has moved overhead again but all of the lightning is in the precip about 3-6 mi. to my north. It is in this area where the most intense cell is passing, causing wind damage at 7:40 in Roodhouse. Looking in that direction, I get this view as the storm is illuminated by lightning. 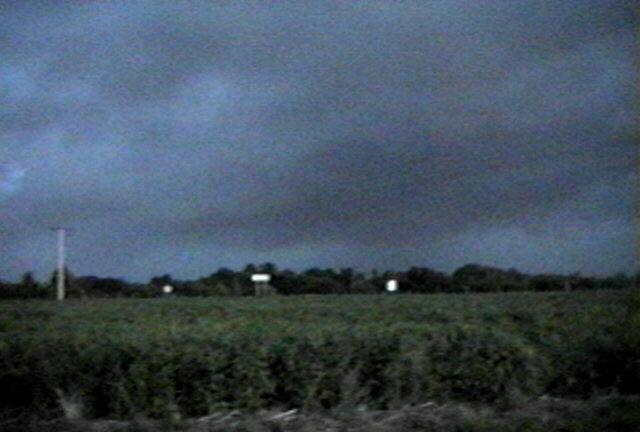 The video shows the scud tags on the shelf cloud moving rapidly to the ESE (left to right). There is an interesting lowering to my WNW between 2 heavy precip areas; it shows motion but no rotation. I think it was associated with outflow. About this time I am thinking that perhaps out in the open under the shelf cloud is not the best place to be standing from a lightning standpoint, but there have been no strikes closer than about 3 miles to my N in the heavy precip. area. 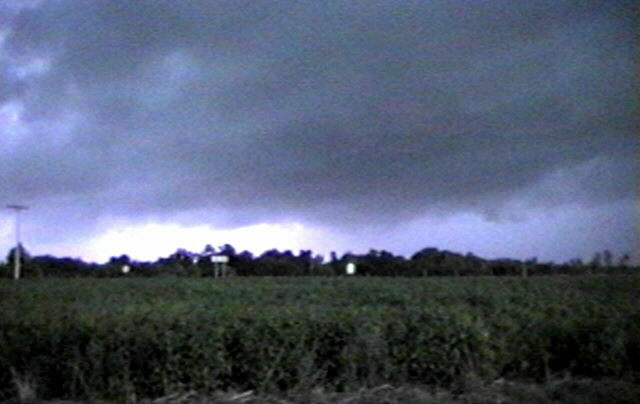 Around the time I am thinking this, suddenly a CG zaps out of the shelf cloud and lights the sky as it hits a grove of trees about a quarter mile to my SE. I was taping the lowering at the time, and decided that, with this lightning being brighter than I had seen, I had better get in the car. As I start to do so - just a second or two after the flash, I hear the crack of thunder and realize what has happened. My guess is that an updraft had gone up over me and begun to glaciate - in the next few minutes 3 more CGs came down in the same general area. I had thought I was safe because all the lightning had been well away, but in reality I was just lucky that the first one didn't get me! This reinforced what I knew but sometimes forget in the heat of the chase: lightning can occur anywhere in the vicinity of a storm. If it starts to occur in a new area, there's always one bolt that's the first one! Back in the car, I bail south again around 7:35 - it was getting quite dark by now. 7:40 - Wind damage in Roodhouse - about 5-10 mi. N of my location. 7:45 - dinner stop in Jerseyville. 8:15 - Heavy rain and gusty NE wind hit Jerseyville as I leave. There was very little lightning with this, so I didn't see it coming as I was eating. Jerseyville is now under a severe T-storm warning. I head south and outrun the rain fairly quickly. Some lightnign continues to my north the rest of the way home. I get home around 9:20. Total chase distance, 156 mi. Storms arrive in Edwardsville around 10:00 but by then are beginning to weaken rapidly. A couple heavy downpours occur between 10 and 11, but no gusts anywhere in the immediate STL area stronger than about 25 mph. AND DEADLY LIGHTNING. STAY INDOORS AWAY FROM WINDOWS. STURDY BUILDING AND STAY AWAY FROM DOORS AND WINDOWS.